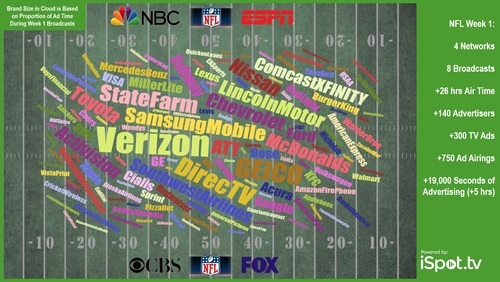 The first TV ad shown during week one of NFL’s 2014 regular season came from Verizon on “Thursday Night Football.” The last ad came from Activision on ESPN’s “Monday Night Football.” In between those two spots, if you somehow managed to watch all eight national broadcasts, you sat through more than five hours of advertising, watched more than 750 commercials and heard from more than 140 brands. Auto makers spent the most time on NFL broadcasts. Car companies occupied more than 16 percent of commercial time on the NFL. Wireless, Insurance Companies, Fast Food and Beer advertisers combined for another 26 percent of the air time. In total, the top 20 advertisers averaged more than six minutes each airing within the NFL’s first week. GEICO, DirecTV, State Farm, Samsung Mobile, AT&T, Chevrolet, Lincoln Motor Company, Nissan and Toyota also each paid for more than six and a half minutes of air time. We have to wait 16 more weeks to see which brand is last to advertise on the NFL’s regular season, but rest assured that between now and then many advertisers will continue to spend many millions of dollars for the opportunity to get noticed by NFL fans.